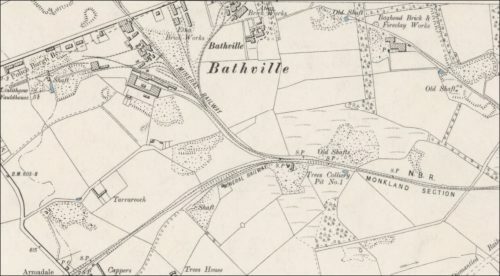 John Watson of Glasgow bought the Bathville site in June 1859 for £10, 000 and shortly after built a brickworks to use the fireclay being mined with the coal. John Watson & Co were to become one of the biggest coalmasters in Lanarkshire, but in 1874 they ran into financial trouble and the Bathville works were sold to James Wood, another coalmaster. James and William Wood formed James Wood Ltd in 1893 to take over their interests in Drumpellier,Westrigg, Neilston and Meiklehill Collieries, together with the Bathville Brickworks. 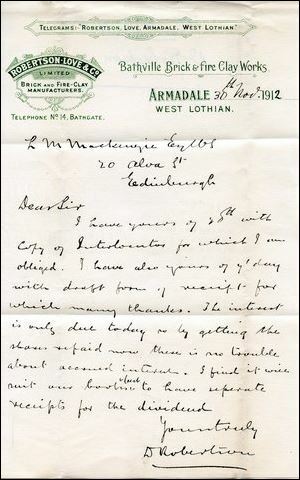 Financial trouble in 1895 resulted in James and William Wood having their estates sequestrated, however James Wood recovered and in 1897 joined Daniel Robertson, a firebrick maker at Bathgate, to incorporate Robertson, Love & Co Ltd., with a capital of £6,000. A sales catalogue of about 1900 shows a picture of the Bathville Brick and Fireclay Works with 2 substantial groups of buildings served by 4 railway sidings. 6 large and 4 smaller chimneys draw the gases from several beehive kilns and 3 continuous Hoffmann kilns. A wide range of firebricks, sewage pipes and decorated chimney pots are shown. United Collieries Ltd was formed in 1898 to amalgamate 9 collieries and a further 23 collieries were added in 1902, among which was James Wood Ltd with Robertson, Love & Co brickworks subsidiary. The capital of the group was £2 million, a very large sum. Among the companies amalgamated was the Glasgow Iron and Steel Company of Clydesdale and Calderbank, who after the nationalisation of their steel interests were to become one of the largest brickmakers in Scotland in the 1980’s. Robertson, Love & Co were liquidated in 1916 but continued to make firebricks as part of United Collieries Ltd. When coal was nationalised in 1947, the brickworks were reorganised as United Fireclay Products Ltd., and comprised the Etna and Atlas Firebrick Works, the Bathville Pipe Works, the UNICOL Tile Works, all at Armadale and the Brownhill building brick works at Clelland, Lanarkshire. The chief refractory brands were Etna 933% alumina), Atlas (38% alumina), and Atlas A (42% alumina), all based on local fire clays. The Bents Mine near Stoneyburn supplied an excellent 42% alumina fireclay from which the Mars brand was made, but the fireclay was worked out and the mine closed in 1929. The Drum Mine near East Whitburn took over and the Northrigg No 7 pit supplied fireclay for pipes and some coal. The Tippethill Mine (38% alumina, 2.5% iron) replaced the Drum Mine in 1960 and the Pottishaw Mine replaced Northrigg in 1963. Woodall – Duckham bought United Fireclay Products Ltd in 1957 to secure their source of fireclay shapes for gas retorts. The modern West Works was started in 1960 with a 400 foot tunnel kiln. Heathfield & Cardowan Pipeworks Ltd was bought in 1968 and at that time the Company was at its largest capacity, employing about 600 men and women. Demand for pipes fell due to competition from plastic pipes and the Bathville Pipe Works was closed in 1970. Lower demand for refractories led to the Etna works being converted to make building bricks under the Etna brand and the closure of the Atlas Works in 1973. The Company had again changed hands being bought by the Gibbons Dudley Ltd for £715,000 in March 1971. 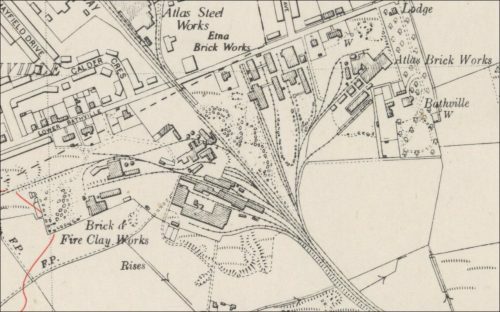 As refractory demand fell further the Company was bought by Steetley Ltd in 1981, who changed the West Works into a facing brick works and sold the Etna and Brownhill Works to GISCOL Ltd.
Below – 17/11/1864 – Theft from Bathville Brick Works. 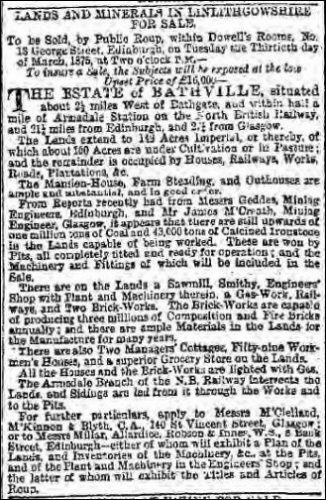 Below – 19/01/1871 – Glasgow Herald – Bathville bricks for sale. Apply John Watson & Sons. 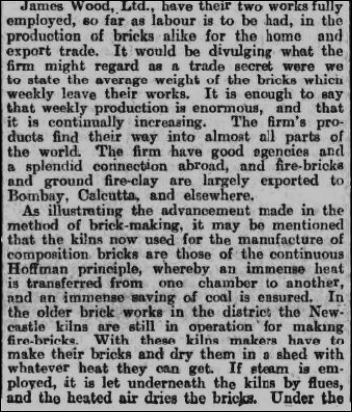 17/06/1874 – The Scotsman – Bricks – Composition and fire bricks, good quality at moderate prices. 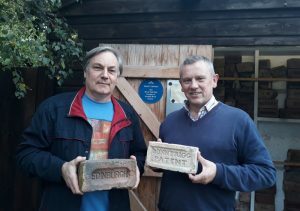 John Watson & Sons, Bathville Brick Works, Bathgatge. 1882 – Robertson Love & Co, Brick and Tile Makers, Bathville Brickworks and at Bonnyrigg. Below- 08/03/1884 – Lanarkshire Upper Ward Examiner – Robertson and Love sued by a farmer. 1886 – Robertson, Love & Co. (brick and lire clay), Bathville Brick Works, Armadale Station. 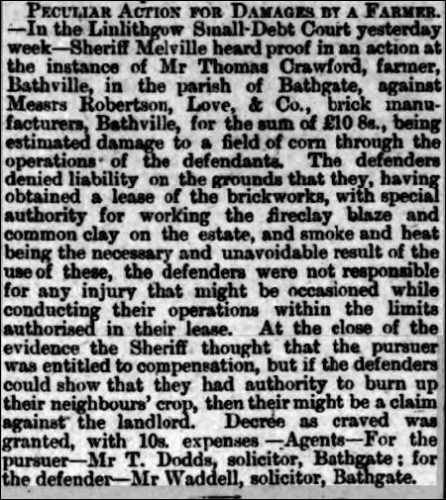 10/12/1892 – Linlithgowshire Gazette – Robertson, Love & Co, brickmakers, Bathgate appealed against their being charged both owners and occupiers rate as they were only occupiers of the work. Mr Wood was the owner. They were entered in the valuation roll at &80 while only £50 was paid to Mr Wood. 1893 – 1894 – Robertson, Love & Co, Brick and Tile Manufacturers, Armadale. 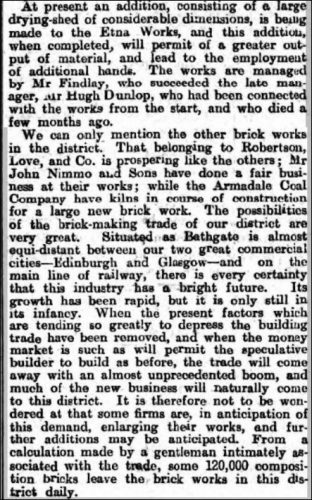 23/07/1897 – Edinburgh Evening News – New Scottish joint stock company – Robertson, Love & Co, manufactures of bricks, tiles etc, Bathgate. Capital £6000 in 2000 preference shares of £1 each and 4000 ordinary shares of £1 each. 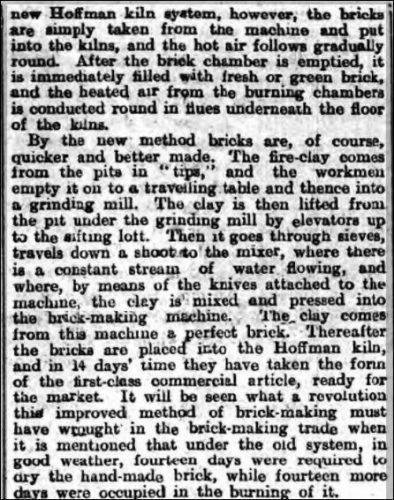 Below – 26/10/1900 – Linlithgowshire Gazette – A history of brickworks in the Bathgate, West Lothian area. Below – 25/01/1907 – Linlithgowshire Gazette – Mr Thomas Robertson – Born Kilwinning. Managed the Hurlford fireclay works. Robertson, Love and Co were first established atthe Bonnrigg fire clay works and then they moved to Bathville. 17/07/1908 – Linlithgowshire Gazette – New drains in Whitburn Road – offer by Messrs Robertson, Love and Co accepted to supply same at 1s 7d per yard. 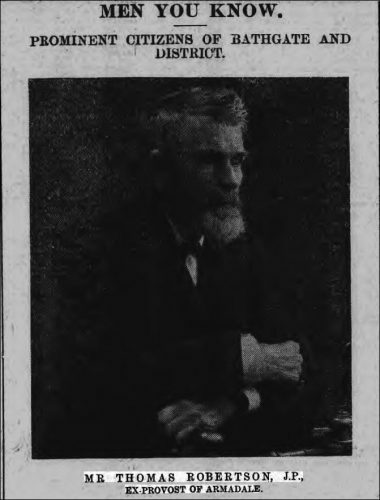 08/10/1914 – The Scotsman – Deaths – Robertson on 9th inst. 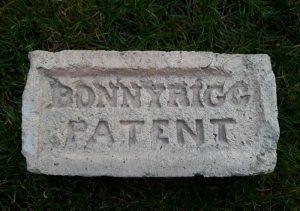 Thomas Robertson, Bathgate, retired brick manufacturer. Below –09/10/1914 – Linlithgowshire Gazette – Etna brickworks and Robertsons and Loves Fireclay Works, Bathville suffering the effects of WW1. Below – 13/10/1922 – Linlithgowshire Gazette – Late William Selkirk. For over 40 years he was the works manager at Messrs Robertson & Love’s Fireclay Works, Bathville. 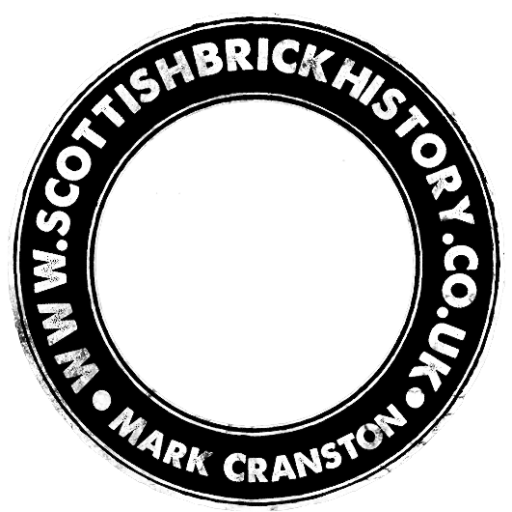 He was trained to the trade of fireclay pipe and brick making in the Dunbar area and then worked at Messrs Roberston & Co’s works as oversman at Bonnyrigg over 50 years ago. 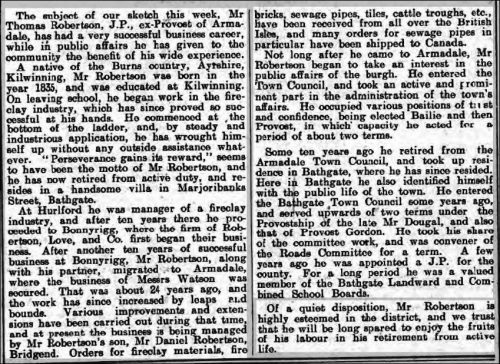 13/02/1925 – Linlithgowshire Gazette – Reference to Mr D. Robinson, manager, Bathville Brick Works attending a function held by the staff and friend of the United Collieries. Below – 1938 – Bathville Brick and Fireclay Works. Found by Tucker Kennedy on the Ayrshire coast. Looks a very early example. 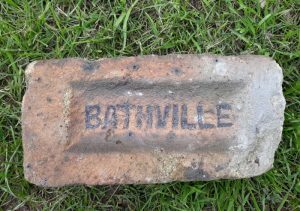 Bathville Brick and Fireclay Works, Armadale, West Lothian. . . .
Found in St Petersburg, Russia by Vladimir Smirnov and most generously repatriated back to Scotland. A wonderful donation. 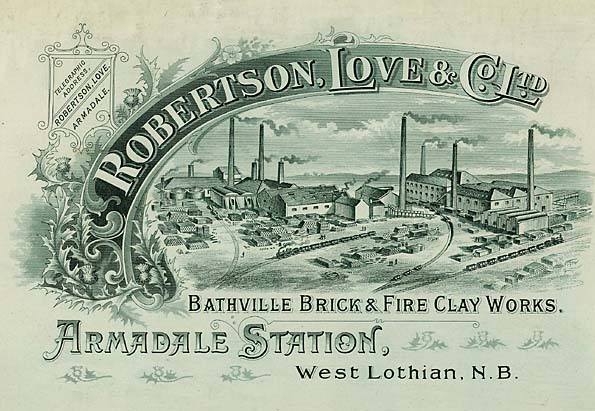 Bonnyrigg Fire Clay Works, Bonnyrigg, Mid Lothian – Robertson, Love & Co. . . . .